The clash began on April 19, 1775 when more about 700 British soldiers were given what they thought were secret orders to destroy colonial military supplies in Concord, Massachusetts. Fortunately, thanks to a rather elaborate colonial intelligence network, led by the Sons of Liberty, the Patriots were aware that their supplies were at risk, and were able to move them to different locations long before the British began to move. Also, thanks to the daring rides of a few brave men, the colonial militia knew that an engagement with the British Army was imminent. Hand drawn depiction of the Battles of Lexington and Concord and the Siege of Boston, by J. DeCosta July 29, 1775. The first shots were fired just after dawn in Lexington, Massachusetts the morning of the 19th, the “Shot Heard Round the World.” The colonial militia, a band of 500 men, were outnumbered and initially forced to retreat. The British army was able to press forward to Concord, where they searched for the supplies, only to come up empty handed. While the British were searching, the American militia was able to reform, and they met the enemy at the North Bridge in Concord, and they were successful this time in driving the British back. 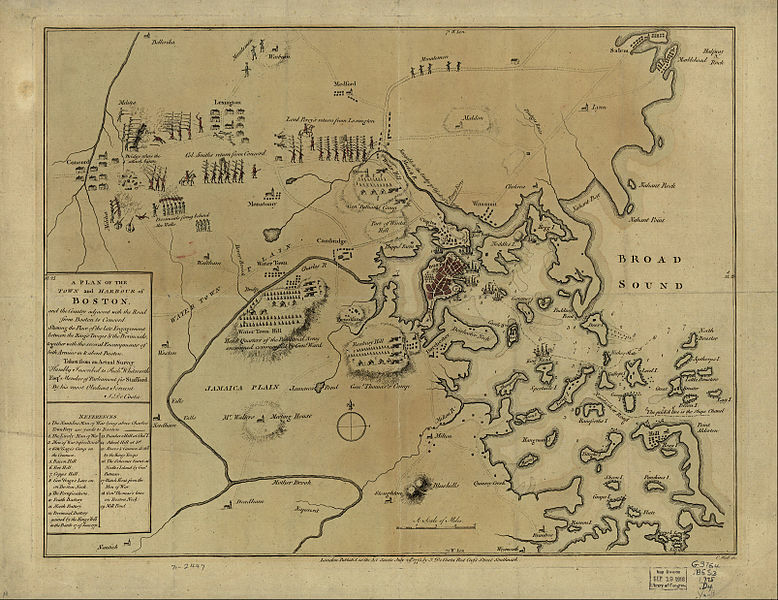 As more American reinforcements arrived, they forced the British army south to Boston, and the militias blockaded the narrow land accesses to Charlestown and Boston, starting the Siege of Boston. The American War for Independence was now in full swing. American children are no longer taught from which we came. How and why America was birthed? Remind or teach our fellow Americans. Most people do not know, or purposely choose to ignore, the Revolutionary War started with the British attempting to confiscate individual’s firearms and ammunition. Disarming the populace is always a precursor to subjugation. April 19, 2015 in Culture, History, Liberty, Tyranny. In 1775 the British had occupied Boston with troops and ships for 7 years. Lawlessness started with Andrew Jackson and continued with Abraham Lincoln. Woodrow Wilson (a self described American Communist) and Teddy Roosevelt were “Socialists”. Tyranny has been afoot far too long. Now they merely feel strong enough to openly declare their treason and subjugation of “the mob” who are thrilled to be slaves.